I loved my kitchen. I wasn't looking for an update. But then the husband tried to open a cupboard & the rubber stopper that was more sticky than anything, was a little difficult to open & that was what started the whole renovation conversation! He threw the idea out of painting the cabinets & new countertops. A little shocked about the idea, I said "Yes! And I want a backsplash & hardware on the cabinets!" I just thought I would put my "most wanted" list out there too! I thought my requests were practical because the painted wall behind the stove was splattered from 17 years of cooking. "THEY" said it was washable but I strongly disagree. I hated that wall because of past dinners that lived on that wall! We have been in the house for 17 years & we never put hardware on the drawers or cabinets. I have snapped many fingernails over the years & have cursed the cabinets for making my nails uneven. One year the husband even bought me the jig for the hardware which meant hardware is coming soon. I'm not sure why I never followed through. I think because it's such an expense & I couldn't decide. Whatever the reason was then, it wasn't going to happen this time! My other request was "I'm not painting the cabinets, because I am not having a Pinterest fail for all my friends & family to see every time someone comes over!" He agreed. So we hired an interior designer, whom my husband went to school with so long ago! Katey came over & she had great ideas. Before she came I knew what tile I wanted. Arabesque. I love the shape & it's different. She suggested dark grout to off set the white tile we wanted & my heart skipped a beat! We went with white tile to tie in with the white appliances. Neither of us wanted to switch out the appliances for a couple reasons. The frig is fairly new, my sink is beautiful & big, the stove is perfect & I didn't want stainless steel. Once we took out the dishwasher, husband suggested we get a new one because it was 17 years old & he just had a feeling that it was going to go as soon as he hooked it back up! I never deny a new appliance. The granite was the first to be installed. The granite guys came and measured on a Thursday & on Monday they were installed. Those were freaky fast. I lived without countertops for 2 days & it was long enough to be just an inconvenience. Tile was next. They installed on a Monday & Tuesday the following week & that Thursday the painters were here taping up the kitchen & disassembling the kitchen. I emptied all my cabinets on Wednesday and cleaned them out & pitched a bunch of a things I no longer needed or used. We left for Spring Break on Sunday & thankfully my parents came over Monday, Tuesday, Wednesday & Thursday to let the painters in & stay while they worked. Bless their hearts. It's moments like these that make me realize what a control freak I am. I like to know what is going on and ask questions to make sure everything is going right. We arrived home Thursday afternoon & the cabinets were all painted, walls were getting the final touches. They came back on Saturday to install the doors & drawers. It was just how I pictured it. Bright & fresh! I am so happy & in love with it. The paint that they used was oil base. It's more durable than water based paint. It does take longer to dry which is why the doors were hung. Yes I was worried about the holes but they were placed where they aren't showing when doors were hung! I was impressed! The hardware was purchased from amazon! Katey suggested have large handles on top & smaller on bottom. 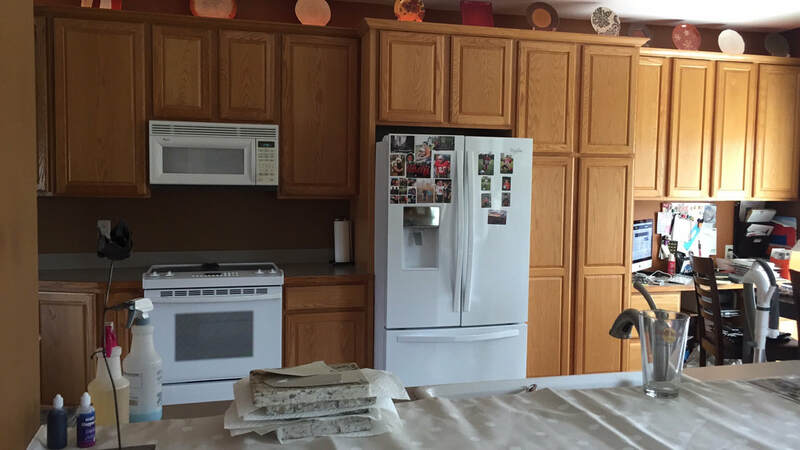 She also sent pictures over showing 3 types of hardware in 1 kitchen. 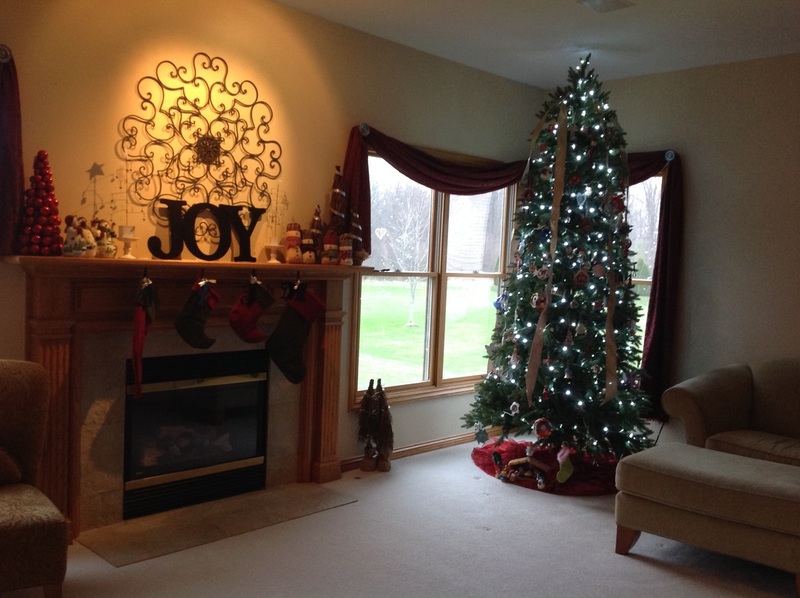 I loved the idea & worked to incorporate that in! The top handles are 5 inches, I would have gone bigger but it wasn't available, the bottom is 4 inches & then I have the cup pulls on the desk drawers. I initially wanted the cup handles on all the drawers but the idea made the husband start to itch & rub his neck. So I compromised & suggested just the desk area & he agreed! First thing I did was empty my dining room which is right next to the kitchen. I moved my dining room table & chairs to the front living room. I then had my kids bring the two 6 foot tables up from the basement. I sat those up in the dining room. I emptied my desk area but didn't empty the rest of the kitchen until I knew when they were coming to do the cabinets. I had about 2 days to empty the cabinets. Emptying the cabinets was great because I was able to get rid of a lot of things I no longer used or needed. Because the sanded the cabinets & walls before spraying (the cabinets) & painting the walls, there was a lot of dust everywhere. I am really glad I emptied everything. I probably wiped the cabinets out 3 times throughout the process. If you decide to paint your cabinets, find out of you (or they, if you hire someone) should use oil base paint or water base paint. There's a huge difference in dry time. We saved some money by taking the countertops out ourself. We took them out on Saturday & new granite was installed Monday. My husband & youngest took out the counters, while my oldest & I were at the FIRST Robotics competition. They had some fun writing messages on the counters. Husband has a sink in the garage with some counter space so I used that for my coffee pot & to do the dishes. We also saved money by pre drilling the cabinets for the hardware before they were painted. We found the hardware pulls on Amazon & spend $160 for all them. Because they were sold in 10's we have a few extra of each. The cup pulls were sold in 5's, which is exactly what I needed. The painter said he would be done Tuesday, but I did it in my head & had a feeling it might be longer. It was & that was okay. Saturday the cabinet doors were installed back in & my guys were gone for the night. I turned on Apple Music & got to work, alternating between putting everything away & putting the hardware on the doors. And once again, I pitched more stuff away! I reconfigured where things should go. Not too much changed but a few things did. 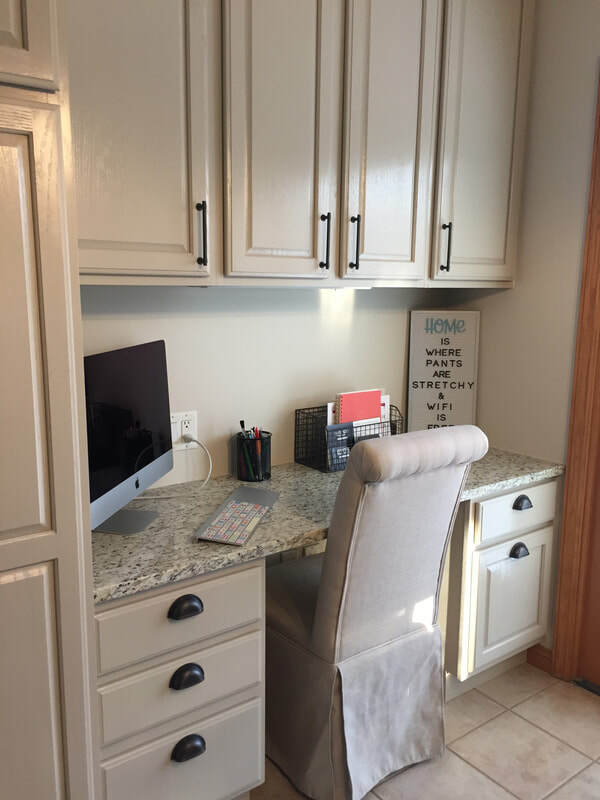 If you have good cabinets, painting them is a great way to update with out a total renovation. I loved my old kitchen, and I really love the updated kitchen. I *heart* my Embroidery Machine! Dear Embroidery Machine......I love you! Embroidering anything is one of my favorite things to do. Maybe because I never had anything personalized growing up because my name ended with a "y". And a name that was always mistaken for "Kathy". Or maybe because I have Souther Bell blood flowing through my veins that makes my heart skip a beat when I see a monogram! But I think those are a few of the reasons why I love my embroidery machine! Another reason I love my embroider machine is because of these cute little bunnies! This is my 3rd Easter selling these cuties! It's the simple addition to the already perfect Easter Basket or Baby Shower gift. I have received several emails explaining the love that a small child has for their new favorite stuffed animal. Mom or Grandma is usually including in the email another order for a new bunny because the other is worn out or they are preparing for a back up in case the current one gets lost. ​These are currently listed in the shop & I am hoping to get more in for the Easter Season! Why January was a Great Month? 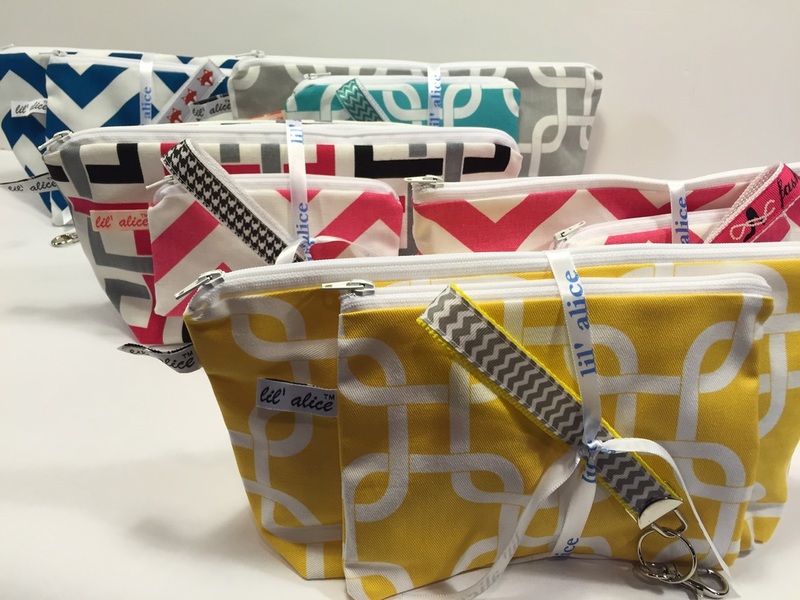 January was a great month for lil' alice Etsy shop! Let me very clear....it's was the best January that lil' alice has every had since 2010 on Etsy! The first month of the new year is usually slow for many handmade shops and handmade lovers usually embrace the lull in activity. I know I have in years past. 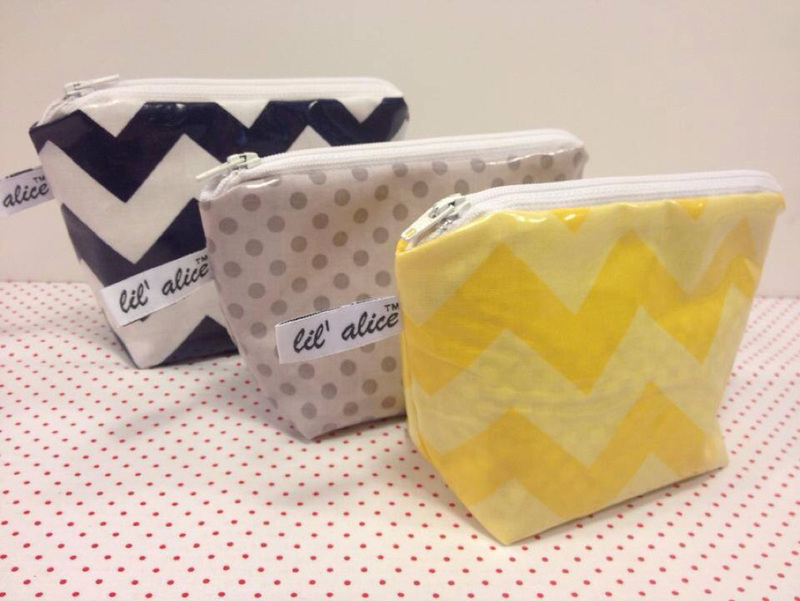 But this January started off with a wholesale order.....(did you know lil' alice takes wholesale order?)! Once that order was processed and paid for, I had already reached my best January! As the month went on, the orders came in. 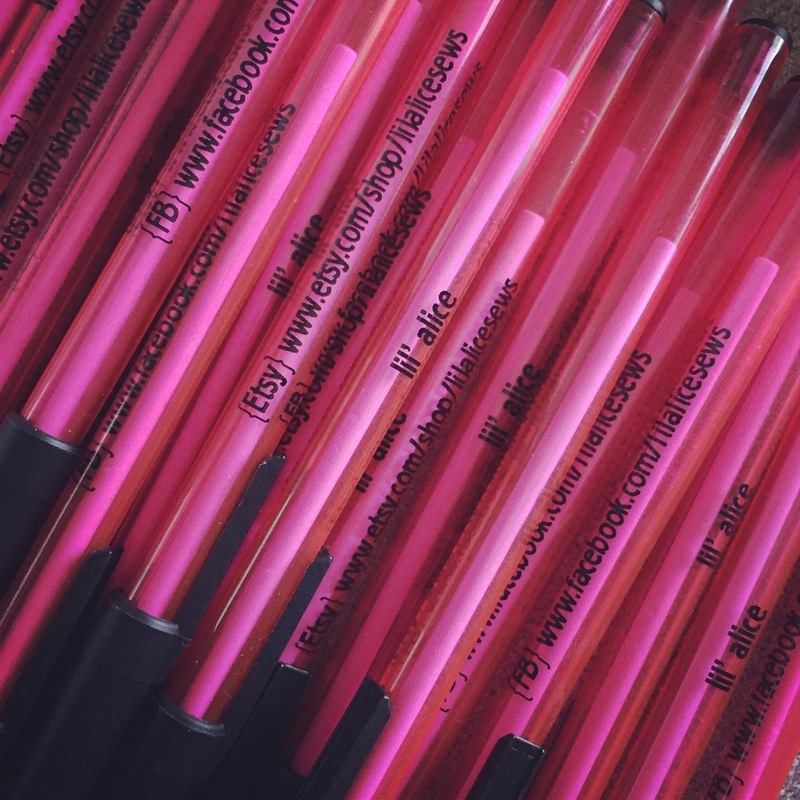 On the last day of the month, I received another wholesale order from a repeat customer! What did I do to make January 2015 the best January? First, I hopped on my Google Doc account and wrote a personal, yet prewritten pitch about my most popular product. I contacted popular blogs that use oils and might be interested in my product and copied my pitch to them. Guess what? Every single one responded! Sitting in the sewing room isn't what it's all about. It doesn't sell itself. It takes a little PR + since I don't have a PR department.....it's all me. 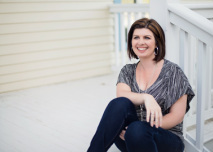 I set aside time during the day, an hour or so, and get to work networking with others online. The next thing I did to make January a successful month, I introduced a new product. The next item on my list was to introduce a new product, I had to invest in a new embroidery machine for the shop....plus all the supplies! It was a Cyber Monday flash deal on Amazon! It's been a lot of fun teaching myself how to run the machine. I have had a lot of successful items that just melt my heart, but I have also had a few "Oops!" along the way! 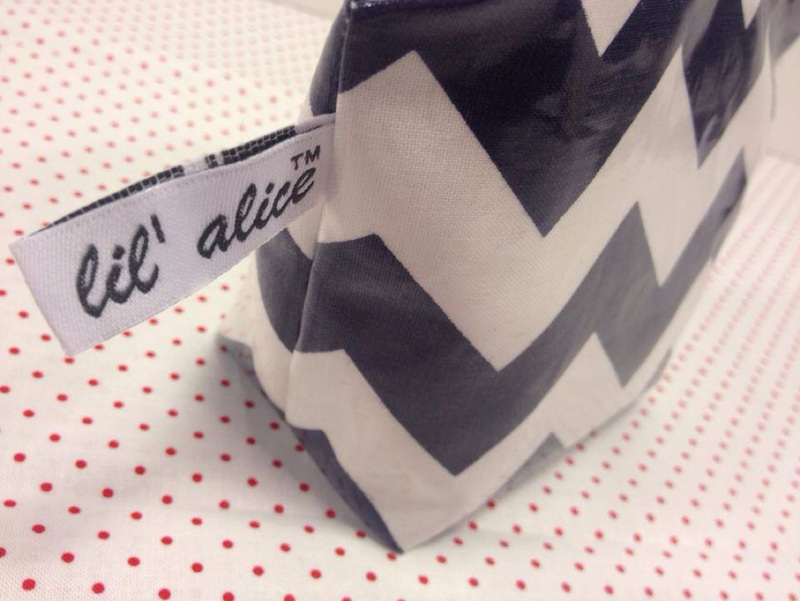 The last thing is to keep things fresh but to carry the brand of lil' alice similar in my packaging and shipping. Having a shop, I am always buying supplies. I am always buying poly bags, tissue paper, stickers, business cards etc. I get very bored with the same look and I look forward to creating new business cards as they begin to run low. I wrap my products in tissue paper and close it with a sticker. I also put a sticker on the poly mailers so then everyone from the lady at the post office who weighs the package to the mail man/woman who delivers it sees the shop name. This time around I ran out of stickers, address labels and business cards. I took advantage of sales on Shutterfly for the stickers and *FREE* thank you cards + I bought the business cards from Vistaprint! Keeping colors + pictures the same carry the brand cohesive! I took this picture of a sewing machine that I bought along with 16 others that are the same from a school auction. I love the pic, it defines lil' alice + I was able to use it on my new stickers, thank you cards, business cards + address labels so it all flows seamlessly. And it's fresh + new! What are you doing to be successful? Leave a note in the comments. 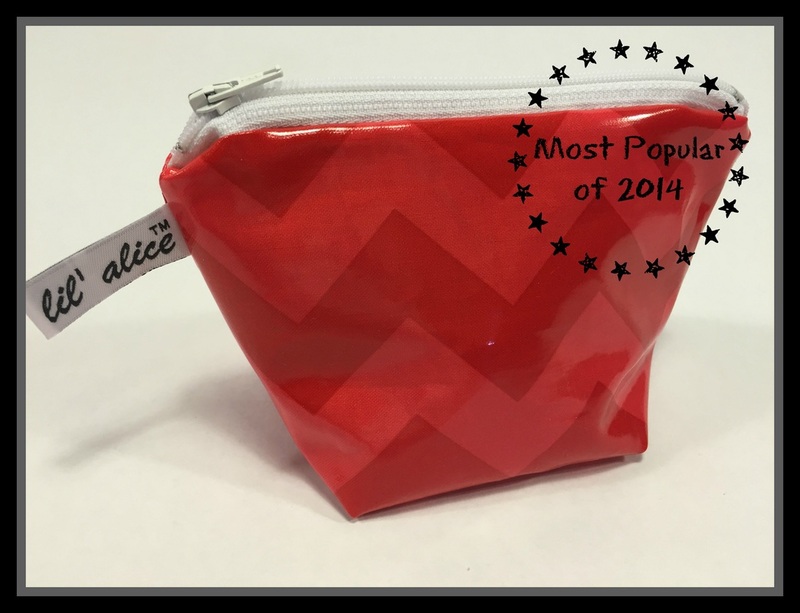 The most popular item for 2014 was The Essential Oil Zip Pouch! I roughly counted + came up with 367 (April 2014-December 2014)! Whoa! That's a lot! And January isn't starting off too bad either! I just shipped 20 to Florida this afternoon! This little bag has been a huge hit + I am blown away. It wasn't my idea. See, a lady came up to me after service in March or April + she told me that she had some oils and she needed something to keep them in + then she pulled out the humbled ziplock baggie. Yeah, we can do cute. So I told her I would figure something out and bring it back the following week. I had already nailed making zip pouches in all different sizes. This would just need a little altering. Oh + I had a spool of elastic for baby crib sheets + I could use that to hold the oils + I had a piece of laminated cotton that I could use for the outer fabric, this was waterproof + would give extra security to the buyer.....and so the thought process began. After two attempts I had come up with a design. You just never know where an idea (either yours or someone else's that they share with you) will take you! But there's a risk + you have to be willing to jump in the deep in. Are a consumer or a producer? You could be both if you are in the handmade marketplace at any level. Or you could just be a consumer and you only purchase products and services. Either way, I am going to cover why it's good to give a review and why it's good to receive reviews and a few ways that I have found to be helpful. First, I am a consumer. I shop. A lot. I shop on Amazon for groceries, yes, that's true. I shop for sales online at my favorite stores, once I know my size for their clothing. And we stay at hotels. I also leave reviews. The top reason I leave a review is because they have asked. I get an email in my box asking me how my product & how my transaction went. It has to be easy for me & I have to be reminded. So a few simple clicks on my part, leave my review, click publish & they have a new review. I believe that it's important to leave facts about a product or service. Adding emotions is okay but leaving facts is a plus. For example, at a recent hotel stay, their coffee was terrible. It was old peoples coffee. Amongst the positive things that I enjoyed about my stay at their hotel, I also made note that their coffee bar, or lack there of, needed some attention. Most people don't like powdered creamer. Just sayin' folks! Leaving a review for Amazon is much different than leaving a review for a handmade shop from Etsy. There's a lot of people involved in an Amazon transaction & it's not an emotional transaction either. Leaving a review for an Etsy shop is going to be ready by the person that thought up the product, shopped for the supplies, carefully created the product, packaged the product, took it to the post office and sent you a notice that it was on it's way. One. Person. Did. That. For. You! I have had a couple customers of mine contact me about an issue with the product they received from me. One in particular sent a picture and said that there was a jam. In the picture, it was a few threads that needed to be trimmed from the back stitch. I emailed her back that she just needed to snip them. She was relieved and so was I. I also thanked her for contacting me privately so I could guide her and let her know that her product was okay and that it in fact wasn't flawed & it wouldn't unravel at the seam. I was thankful that she didn't leave a nasty review saying how terribly made the product was and that it was jammed, but instead we came to a solution through messaging each other and the picture she sent me. Next, I am an Etsy shop owner in the handmade marketplace. I am always learning. I read non stop about how to improve and grow my business. My latest endeavor is focusing on how to get reviews. I can wish & hope that they will just do it on their own. But remember, I have to be reminded to leave a review, I am sure I am not the only one that needs a reminder or an incentive. I took action on how to get more reviews & it's working. 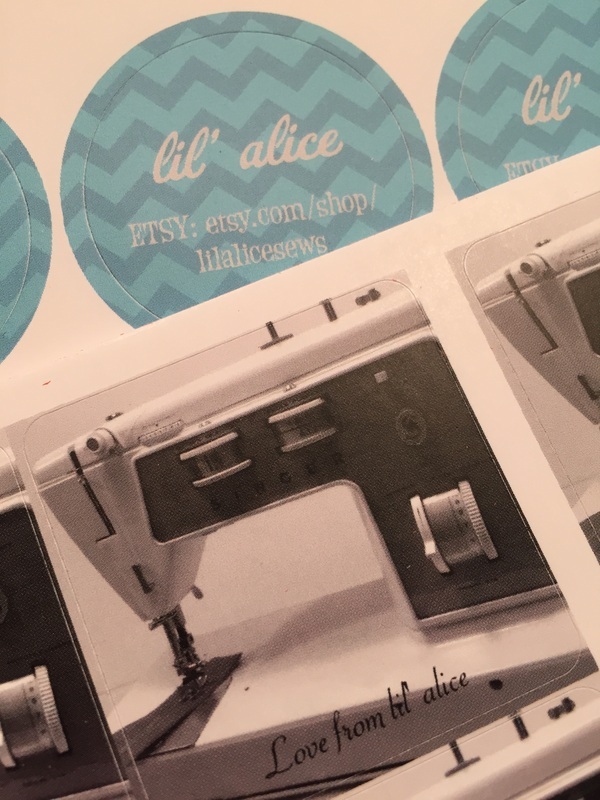 On my Etsy site, when an item is purchased the customer gets a Thank You note with a link to my lil' alice FB page to connect with me there. The consumer receives another note after I have stopped at the post office to ship them their package. In that note, I ask them to write a review once they receive their product. Once a receive a review from them, I write them a personal note saying thanks for the review along with a coupon code off of their next lil' alice purchase! Simply ask for a review, then when they respond to your request, give them an incentive to come back. We are all consumers. We are often thrilled with our purchases, but sometimes, there's disappointment too. We are so quick to leave negative feedback and we forget to let them know that we fell in love with our other purchases. Good or bad, leave a review. 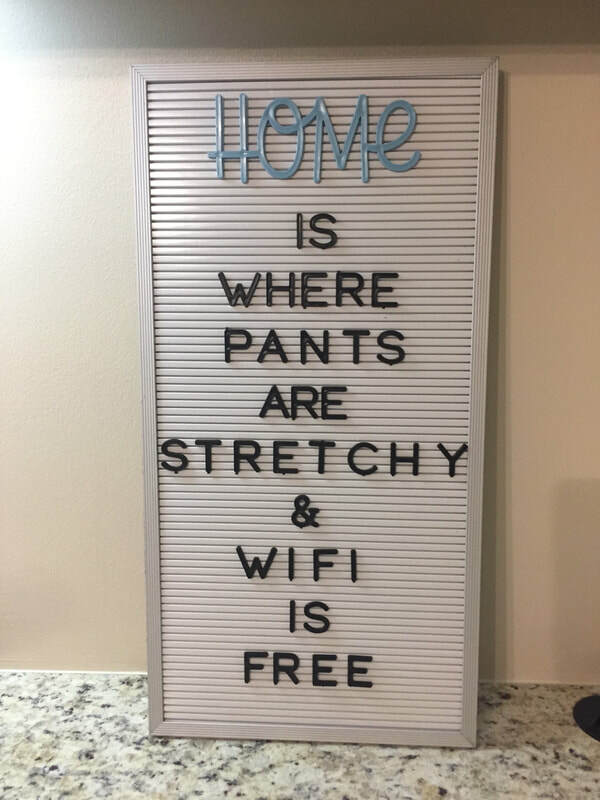 An honest one. You never know, you might get a coupon code for your next purchase! An Amazing April for lil' alice! April was an amazing month for lil' alice. At the end if March I made a Essential Oil Zip Pouch for someone who wanted something cute to carry her oils in as opposed to the plastic sandwich bag. This was actually an easy adjustment to the essential zippered pouches that I already make and can make in my sleep. Today is the first day that I have been caught up on orders for these! It's been a constant flow of orders thru Etsy. I have +60 of these darlings all over the United States, a few to Canada, and one to Singapore. I am blown away from all the orders + the repeat customers too! 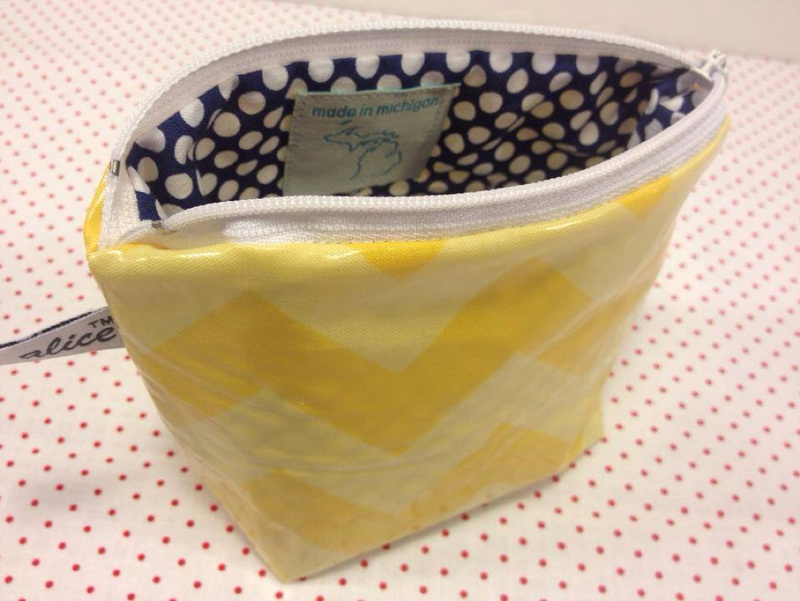 What makes this Essential Oil Zip Pouch such a hit? it's laminated, which makes it waterproof and easy to wipe. elastic is sewn onto the lining making 8 spots available for the oils to be held into place! it has boxed corners, which allows it to stand on it's own. it's sturdy, not floppy or flimsy! What else can these be used for? Since there's elastic on the inside to hold the oils, it could also be used to hold lipsticks and nail polishes too. Head over to the lil' alice Etsy Shop and see the new fabrics that were just listed, because the previous prints are nearly sold out (like the yellow chevron). About 5 weeks ago I went on a "No Poo" adventure. That simply means I&apos;m not using shampoo + conditioner to wash my hair. What am I using, you ask? 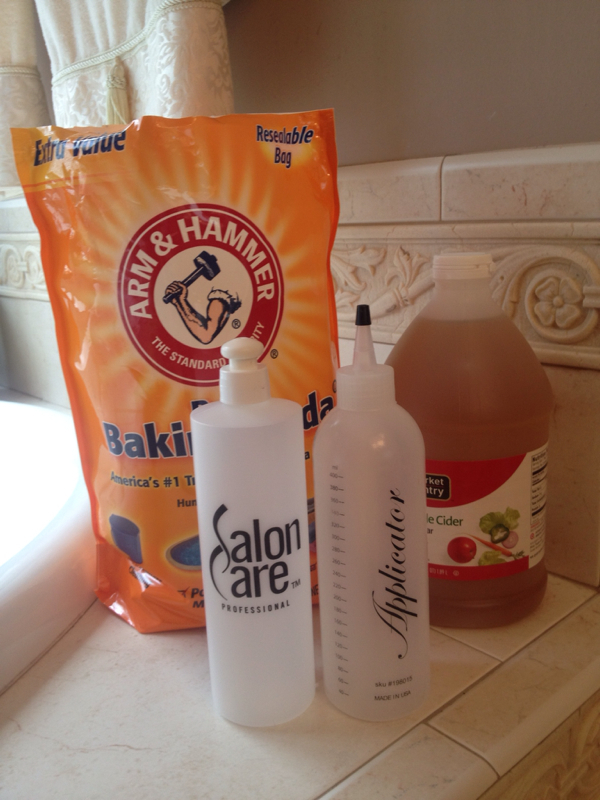 Baking soda mixed with water and Apple Cider Vinegar mixed with water. I&apos;m not sure of the portions but it&apos;s working. -My hair is fuller. Like shampoo commercial fuller. I have really thick hair and this just enhances it. -I loose less hair. I&apos;m not sure why but I&apos;m not pulling out handfuls. I have a comb in the shows and I run a comb thru it and it&apos;s visibly less. -My hair felt dryer during the first 2 weeks or so. I almost gave up. But on the 14th day it felt better. It was the first day I actually liked it. I don&apos;t have oily hair at all so this is expected. -Before I washed my hair every other day, I&apos;m going 4 days now and it still feels great. I don&apos;t feel homeless. 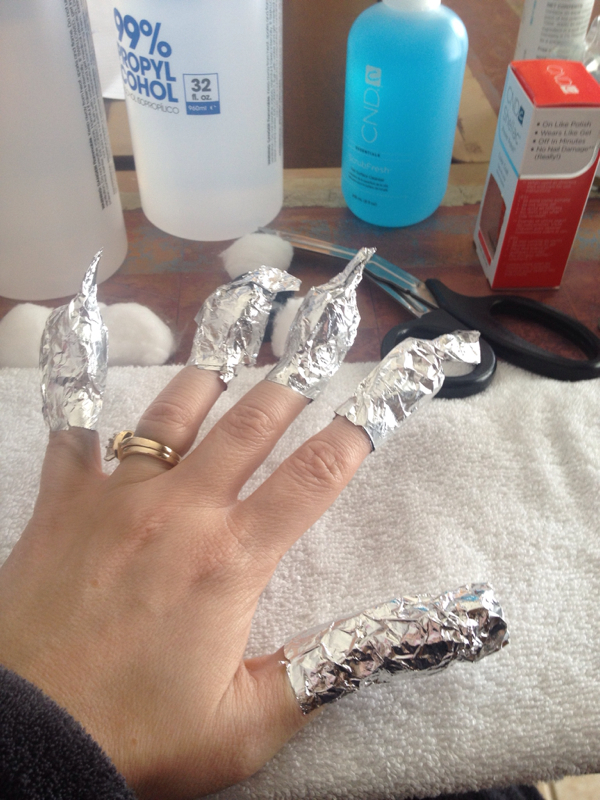 Next, my nails. I use to paint my long nails when I was younger. Like, before I was married, before I did dishes, scrub sinks, toilets + before kids. "Back then" my nails were always nicely painted. I was drawn towards reds and browns. They never chipped. They lasted forever. And my nails were always a long length and all the same size. I&apos;m a bit picky. I don&apos;t want chipped nails. With my hands always being in water my nails would chip the next day and I would be taking it off. A waste of time to me. Oh and the drying time with the littles, impossible. 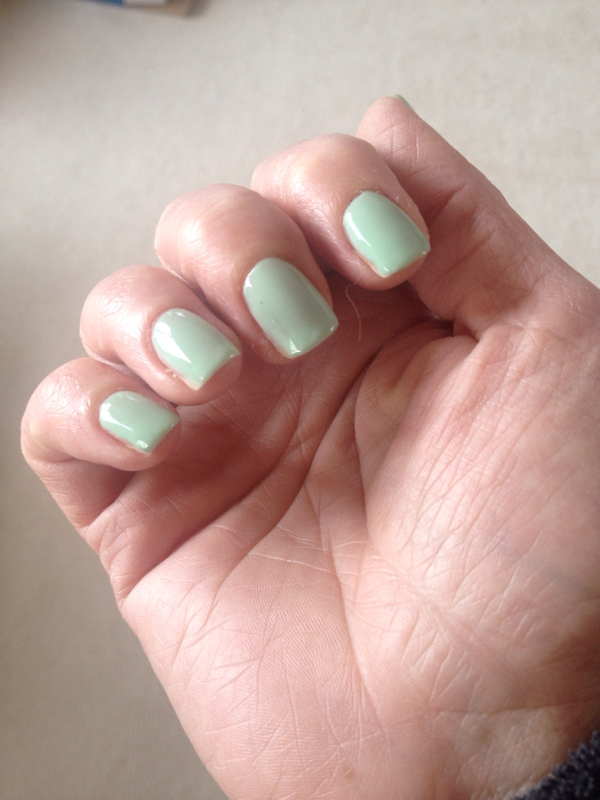 A couple years ago I did a set if gel/shellac nails. They were okay but a bit of an expense. About 5 weeks ago I tried it again and I liked them. Had them done again and I loved them even more. The polish didn&apos;t chip and my nails didn&apos;t break. SOLD. I graduated from cosmetology school the same year I graduated from high school. It was a vocational option. Through the years I&apos;ve kept my license up. I&apos;ve been tossing around the idea of buying everything and doing it myself. I&apos;m about a 25 minute drive to a nail salon, then if I have to wait it&apos;s more of my time. Plus the cost of having them done. I purchased everything this week. I knew the process just from having then done. But I also watched a few you tube videos for clarity. Yesterday I did my nails and I&apos;m really happy with the way they turned out. And I know I will be doing this often.